MACABRE "Murder and Margaritas at the Las Palmas!" A man named "Death" is uniquely qualified to become a chronicler of murder. What depravity would a man named "Corporate Death" be capable of? What psychoses and neuroses would drive someone to construct nursery rhymes about human fiends and monsters like Albert Fish, Jeffrey Dahmer and The Zodiac Killer? Those questions kept me up at night, so I was determined to go to the source to find the answers. "Corporate Death" is the voice behind the Chicago murder metal masters MACABRE...a twisted trio that has spent the better part of 30 years celebrating the bloody deeds of killers throughout history. 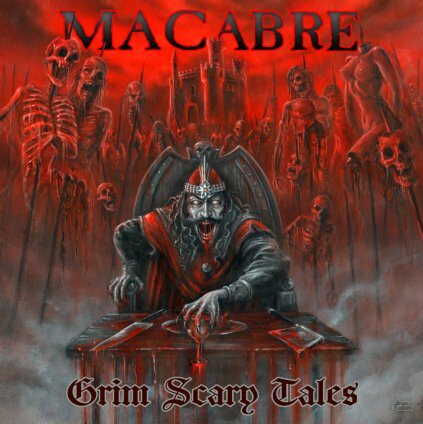 On the latest Macabre effort "Grim Scary Tales", Mr. Death and his accomplices explore a new batch of maniacs including Vlad Tepes, Emperor Nero, Bela Kiss and Lizzy Borden with a metal assault that includes influences from other genres. I finally managed to contact Corporate at his lair...not a murky chamber filled with human remains, but rather a cheerful Mexican restaurant in downtown Chicago! He is quite the chummy chap who spends his spare time involved with karaoke when not relating gory mayhem. But then, don't they say that those are the type of guys you should beware the most? Following is my most enjoyable chat with Corporate Death. I managed to survive the encounter this time, but when I see Macabre live...oh, that's a different situation entirely!!! CORPORATE DEATH: This is Corporate Death from Macabre, how are you doing? WORMWOOD CHRONICLES: Very good, sir. Thanks for calling, Mr. Death! CD: You're welcome! I'm at my office right now,which is across the street from my house. It's a Mexican restaurant and I come up here and have Margaritas and write music all the time. I have tequila for inspiration. If I need a push to get a song going, I just have a shot of tequila. No, I'm just at the office. That's what I call it, I should be paying rent up here. WC: It sounds like an admirable way to get inspiration! CD: And they have good Margaritas, too! WC: What's the name of the place? CD: It's called Las Palmas. They have like ten of them in the Chicago area. It's right across the street so it takes me one minute to get here. It's kind of a dangerous place to live, as I have to cross a pretty busy street to get home. WC: It's the weirdest coincidence. I'm from Rockford. We just had a major shooting in town and the name of the place where it happened was the Las Palmas Grocery Store! It can't be connected to your restaurant but it's pretty strange that came up! WC:Not many palms in this neck of the woods right now. (It's early February) Let me slip right into the interview now that we've broken the ice with a shooting. (laughs) It's been quite a while since your previous record "Murder Metal" came out. You've had a while to think of new tricks. What new approaches or techniques did you try on "Grim Scary Tales" that you haven't done before? CD: I took a break after "Murder Metal" from reading and writing about killers. Just for my own sanity. Too much of anything is not good for you. Even water. If you drink 50 gallons of water in a row, that's called "drowning". (laughter). I came back with a fresh perspective when I don't ready about killers or write for a while. Then I sit down and intensively read about these guys and wrote lyrics for two or more years. I had so many songs that I was like, OK, I've got to do this in two albums. So "Grim Scary Tales" will be a two part album. CD: Yes, I'm going to try and record Part Two this year. When I was in my writing mode, I wrote a lot of stuff for Part Two. We've even practiced stuff on Part Two already. The timeline on "Grim Scary Tales Part One" ends about World War I. The last song "The Sweet Tender Meat Vendor" about Karl Grossman is just a little bit after World War I. Part Two might continue starting in the late 1800's and go to modern times with all the modern killers. We'll have some new songs about guys we've already written about, like Ted Bundy, John Wayne Gacy, Albert Fish but also a lot of different killers we've never written about before. There's going to be a lot of variety, like I tried to do on Part One. Different musical styles and sounds. WC: What's the criteria for deciding what killers you write about? It sounds like it's a chronological method this time around. CD: It was chronological. (Buzzing sound intrudes) Hear that blender going? That's for my Margaritas! CD: It looks a little bloody. I don't know! But as far as the criteria's concerned, it was just the characters that stood out in my mind. 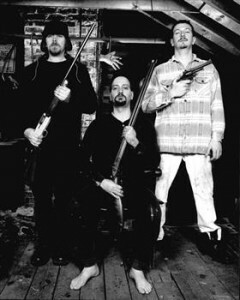 Not so much spree killers, we haven't sung much about spree killers on the last few albums. "Sinister Slaughter" I did have some spree killer stuff on there, where guys just go out and explode and kill a bunch of people. We're more into the real sick ones, the serial killers that killed over a period of time, where it wasn't a one day thing. The chronological element did play a part in it. I went back to the earliest recorded killers I could find. I'm sure I could have taken it a lot farther but I only had so much time to work on this. WC: Locusta, the subject of the first song on "Grim Scary Tales", was the first known serial killer, I've heard it said. CD: The first recorded one. Probably not the first "known" serial killer, but the first one whose exploits were written down. WC: There are a couple of characters on the new album that are more than just serial killers. Dracula, aka Vlad Tepes, and Nero were dictators that controlled a lot of lives. Would you consider tackling Nazis or Communist dictators as you get to the 20th century? CD: I'm not going to go in that direction with it. There's all kinds of directions I could go with this Macabre thing, but I think it would water it down if I was to start doing that. We concentrate more on serial killers, but the songs with Dracula and Nero were more historical. Going back and picking out the weirdest characters in history from the old killers was what I was after. But no, I don't think I'm going to get into dictators on any of our stuff in the future. When we were doing our first album "Gloom", we were doing songs about embalmers, funeral directors, grave diggers and stuff like that. At one point, I said, "let's do killers!" Let's drop all this stuff. "Sinister Slaughter" was really the first album where we went all out and did all serial killers. We're gonna stick to the killers, but we're not just limited to that. Do you have to stick to serial killers alone? No. WC: You could make a pretty good case that Vlad Tepes was just a serial killer who took control of a country. He killed a LOT of people. CD: This guy killed a a lot of people. He was in all kinds of wars, he was a soldier and warlord. The song's not about that so much, but about his historical legend. About his being "Dracula". He's the most famous movie character of all time, the most popular of the monsters. We took it in that direction on the album. WC: From all the characters on the new album, which would be the one you'd most like to meet and which would be the one you'd LEAST like to meet? CD: Wow, that's a tough question. Let's see. Probably the one I'd least like to meet would be Joseph Vacher, the "Ripper Tramp From France", this wandering tramp who would just walk up to people with scissors and start stabbing them. Or maybe Giles Garnier, the "Werewolf" we talk about in "The Big Bad Wolf". He was a cannibal that would kill and eat people. I think he preyed more on little kids, though. I'm not that small. I think I could put up a fight with the guy. And I'd probably have a gun with me. (laughter) I'd have the advantage then! WC: That's a good equalizer because with a guy like that, you can never tell. WC: Not even a Margarita! Going back a little bit, you spoke about the days of "Gloom" and "Grim Reality". Way back then, was there any inkling that you would still be playing in the year 2011? CD: I've always liked music. I've never planned on stopping. (LAUGHS) As far as Macabre goes, we had to establish a band, get something going. If you bounce around from project to project and band to band, it's like starting over again. We've estabished ourselves and we've been friends for so many years, our styles just mesh together so well. We could just sit down and play a bunch of new music on the spot for you, we could literally make it up on the spot. I've known musicians like that, who could just free jam for hours. No, I never really thought about us being together so long, to tell the truth. Are we going to be together 26 years from now? No, I never thought of it. But I always planned on starting a band and sticking with it. WC: I can't think of any other extreme metal band where it's been the same guys together for so long with no interruption at all. The way you mesh with each other must seem almost telepathic. CD: We have our own lives going. We're great friends, we're like brothers, but we're not around each other constantly. We'll gear up for certain things, I'll write a bunch of music, I'll write a bunch of lyrics, like I did with "Grim Scary Tales", and we'll get together and work on it as a team. On tour buses, we can get a little testy with each other at times. You're stuck with people there. But I go out on my own and walk around different cities in Europe or wherever we're at and just get away from the crowd. I'm more of a hermit where I go out on my own and read books in coffee shops or have some beers in a bar. I just got my own way of handling it. WC: It's quite an achievement, your longevity, I would have suspected the secret was NOT staying on top of each other all the time. CD: That is the secret. It really is. WC: Is the music business as much fun for you now as it was back in the day? CD: When you first start touring, it's like Disneyworld, you know?(chuckles). I mean, that's what it's like. The first tour I did of Europe, with Pungent Stench and Brutal Truth, was in 1994. We'd been to Europe before that for some festivals or single shows, but that tour was like two and a half months! We did two shows in Israel before that by ourselves, and then we 70 shows with these guys. That was just an experience I can't even remember or describe! (laughs) I remember a lot of it, it was great. But these days, it's still great. We just did a tour with Napalm Death, Immolation and Waking the Cadaver. It was a great tour, we did 36 shows It was supposed to be 37. The Italian show was cancelled. WC: That's a tremendous line-up. CD: It was just so fun. The guys from Napalm Death were great. Ross and Immolation were great. They're real gentlemen, they're not out of control where they're breaking stuff. Everybody's on their best behavior. Of course, everybody's having their whiskey and drinks and stuff, after playing of course. Everyone's great on these tours. If we hear ahead of time if there might be a problem, we just won't do it. We know so many bands. If a good tour comes up, we'll jump right on it. WC: When you guys started out, there was none of the downloading problems. There was a big tape trading scene, there were a lot of zines. The extreme metal scene was something new and evolving. That's all kind of fallen by the wayside. CD: Yeah, yeah. we used to rent a practice spot from the guy who owns the place. Ministry used to practice there. There was all these Chicago bands...it was a huge place. Kind of a dangerous area. Prostitutes out front asking you for a beer or something when you're walking in the place. I've seen a pimp chasing a prostitute with a big broomstick, trying to hit her when she's running around a car. Stuff like that, you know. I used to keep a gun at the practice spot. There was one entrance and one exit so if something happened, you were in this one little room. OK, not the best area, I'll keep a small gun here. No .44 Magnum or anything like that. Just something to keep somebody off of ya, that's all. WC: Is there any chance we'll see another record from the Macabre Minstrels? CD: Well, that's definitely something we've thought about. The next album will be "Grim Scary Tales Part Two", like I said, and then I want to do an Albert Fish album. A musical about Albert Fish. It will be half acoustic, half electric. I wanted to do an all-acoustic album about Albert Fish and we already have a lot of songs about that. We've been doing this stuff for years. In 1990, I started writing this stuff but we never put it out. I have all this seafaring tunes, sailor music, and it's called "Fish Tales--The Album". I decided I should do it half electric and half acoustic and blend those songs together. We'll see what happens, but I want to do Part 2 of "Grim Scary Tales" before I do that. We've done some limited shows like Obscene Extreme in the Czech Republic with that material. We also played the intermission of "The Torture Show" where there are people hanging from ropes and all sorts of blood crap from the chains they're using to elevate themselves. We did the intermission of that and we played some Macabre Minstrels material for about 40 minutes. It went over very well! It was perfect for the Torture Show. They had all these girls running around in vampire capes with blood coming out and it was just so perfect! (laughs) I don't think our playing was that great because we're not used to doing this. It's kinda hard to get out there because we don't practice the material that much. And as far as a tour with both Macabre and Macabre Minstrels, that's going to be tough. I scream my brains out on Macabre and then to do the clean vocals on Macabre Minstrels kind of wrecks things. The next night, I might not be as good on the clean vocals. But we might do some isolated shows with Macabre Minstrels. Probably not a tour, but we'll do some stuff. WC: Needless to say, we won't have another 8 year gap until the next Macabre album? CD: Well, I'm going to try and record it this year and put it out next year. I'm not going to try and put it out this year. We've got a lot of touring coming up. It's just a matter of me getting this music together. On "Grim Scary Tales", I did all the writing and lyrics. It's a matter of arranging it with the other guys in the band and getting comfortable with these songs. I don't know how much time we're going to have. We've got an April tour in Europe...we're headlining and we'll have General Surgery with us. Then in July we're going out with Exhumed, they're going to be the headliners there. After that, we've got Canada in August and probably Australia coming up after that. It's going to be a rigorous touring schedule but I'm ready for it now, man! We took a little break so I'm back! I'm back! CD: We never really stopped touring before. When you don't do albums every other year or every two years, the opportunities aren't there. So we'd did some festivals in Europe and limited touring, but when you've got a new record out, it's time to get serious and really tour. WC: You're really using a wide variety of vocals on "Grim Scary Tales"...more than ever before. CD: I do karaoke, I do maybe 40 different Beatles songs. Johnny Cash, Johnny Horton, Roger Miller...I do all kinds of vocal styles. I try to incorporate that into Macabre. People seem to like it. We were doing that song "Nero's Inferno" on the last few shows and people are dancing to it. OK, cool! That's more operatic. I love variety. It would bore me to do the same vocal style all the time and stick in the same mode vocally and musically. We can go in just about any direction we want to go. As long as I don't do rap and stuff like that. As long as we can call it "murder music", we can go in any direction...country, pop, any style, as long as we sing about the killers and tell stories. Versatility is just more fun for me. WC: I still like listening to the classic rock of my youth but I didn't really stop with that, I progressed straight thru to today. Though I have to admit the 80's era of underground metal was my favorite, it will never be surpassed. CD: Yeah, there's so many bands these days. It's so hard to break through for these bands, you have to have something really special these days. The bands that have been around for a while will have their followings, like us. We have a cult following that we've had for years, but we're always gaining new fans. These people that saw us on the Napalm Death tour...even young kids who have never seen us before...they'll buy a CD and come back and see us on the next show. We're always progressing and getting new fans, but a good part of that is being different. "What are these guys all about? ", people ask. They're bouncing all over the place. But that's our thing, you know. CD: I don't know, we'll see what happens. I plan on taking Macabre to the next level now. I'd like to get as many different characters in the show as we can do in a night. It's not going to be every song, of course, but you know how I tell stories between songs? I'd like to get some more breaks for myself. I'd like to get video footage playing behind us on different screens. After we play a song, it kicks into an interview with a killer, setting up the next song. (chuckles) I can take a little break, have a sip of my beer and make it more interesting for people. I thought of this years ago. I saw Weird Al Yankovic. He does these comedy interviews in between skits. I'd like to have the real killers talking in between the songs to set the next song up. Now I'll still talk between songs, especially with historical killers where there's no video footage of them. WC: I think that's a great idea! I'd like to see that happen! CD: Well, it's not going to happen on the next couple of tours but I'd like to get it going this year. We'll dress in our farmers clothes, get a gory looking stage...we'll see what happens. WC: What was the last CD or record you got just because you wanted to check it out? CD: Oh boy, I haven't bought anything in a while. I don't buy a whole lot of metal stuff. I buy certain bands, especially really technical stuff. I like Behold The Arctopus, that's the last one I got. 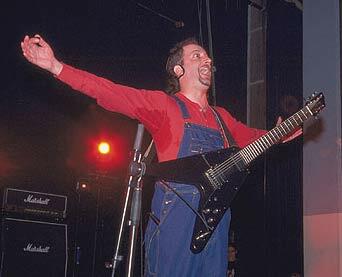 It's real extreme virtuoso guitar playing with no vocals. I don't know how these guys could possibly even write the stuff. They're such virtuosos on their instruments. I also like another band called Estradasphere. WC: I've heard of them. Kind of gypsy jazz with a little metal in it. CD: I'm a big John Zorn fan, I try to buy all his stuff but he's got so many CDs, it's hard to keep up with John Zorn. I'm a big classical fan. I love Bach. If I was stranded on an island with style of music to listen to, I'd probably choose Bach. Beatles are probably my favorite modern day band. I do like metal stuff, but the metal styles of the bands today aren't a big influence on me as far as wanting to sound like that. I get more of my inspiration from older styles and melodies and just come up with my own heavy music from that. CD: I want to know. What is it? WC: They are called Gigan. They're named after the giant Japanese monster. CD: How do you spell it? WC: G-I-G-A-N. They're really unique...sounds like the play everything under water and backwards at twice the speed. CD: I like the trippy stuff, too. I play around with the guitar synthesizer and use it between songs to add some ambient effects. I can do violins with a guitar, keyboards, horns. I used some of that on "Grim Scary Tales Part One" but I'll use it a lot more on "Part Two". We can actually use it live as a three piece band. I don't want to add any members to the band. WC: "Part One" is a great album and I really look forward to the live show. I hope to stay in touch if you manage to keep out of jail! (laughter).